I would tend to disagree a little, Dr Collins. Whilst I appreciate that simply being able to spiel off a list of statistics doesn't actually prove anything, I would still expect it from Gerry. Considering that one of the major platforms he is choosing to attack the failed Fianna Fall government on is the economy itself, he should at least be able to hold a conversation about it. For my money, it is similar to the dilemma Alan Johnson found himself in in London – clearly more than competent, but couldn't convince anyone of it because he hadn't done his homework for the soundbites. Apart from dispensing subjective history lessons, blaming the Brits for all of Ireland's woes and recounting his non involvement in the IRA, he has absolutely nothing of substance to say. The Politicians, Financiers and Bankers share equal responsibility for the country's economic decline, but let's be honest here; Joe Public overspent and avoraciously hoarded cars, houses and luxury goods on cheap money in the feel good years. The Irish people want answers and solutions and not platitudes and soundbites. Gerry's 'let's put it up to them' is hardly an analytical approach to economic recovery. Reporters, journalists and even FAILED politicians are biting at the chops to be next in line to get in the interview ring with Adams. Even Enda Kenny who hates interviews wants Gerry participating in the next debate just so he doesn't come last. Nicely put Jude. You'll see the anoraks of the state lining up to take pot shots at GA while the state sinks dramatically. Why aren't FF hammered for their economic illiteracy after all it was their policies that got us into this mess in the first place! Pete mboy – I agree that it's expected that Adams/Johnston know certain facts; but my point is, does it matter? I think it's perhaps electorally damaging not to know them, but facts are dead things, useless, except employed to achieve something. You know that. I've responded by email. You have a point but I think you're overstating it. Anon – I agree. I hear today that SF may take a seat in quite a few 5-seat constituencies, and that has galvanised the opposition to fling everything they can at SF. With help from the usual media suspects. Just a thought: there are clearly quite a few journalists, north and south, strongly antagonistic to SF. Are there any journalists, north or south, who are PRO -SF? And if not, is that because none exist or because they don't get a platform? Worth remembering that the revisionist narrative with regard to 'that' 2007 debate conveniently ignores the fact that the political party of the purported debate winner (McDowell) was wiped out in the subsequent election. The polls, for tomorrow's Sunday Business Post and Sunday Independent, indicate that Fine Gael remains on course to lead the next government, and that a coalition with Labour would have a comfortable majority. That poll also shows that just 20% of voters say Micheal Martin's election as leader would make them more likely to vote for Fianna Fáil. By the way the term 'journalist' is like 'model' or 'actress' (the last is how Mandy Rice Davis described herself). It does not actually mean a paid-up member of the NUJ but more a middle-class commentator. Whilst I agree in principle that being able to recall certain facts and figures doesn't disqualify someone as competent in a field, I think in Adams case it highlights to the electorate a certain ignorance of the situation that is wholly unacceptable in someone who is, at least technically, a candidate for premiership. 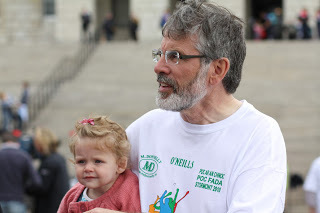 Gerry Adams has been, with some justification, hailed as a brilliant political campaigner. Unfortunately for him he made the cardinal sin of not being prepared. This led to him sounding like a blow in, a tag which his opponents are going to do their best to make stick. Sinn Fein, in my eyes, are actually offering a real economic alternative to the people of Ireland (though it may not be one I entirely agree with). Whilst Adams ignorance of Child Benefit rates or VAT rates don't have an impact on the validity of SF's economic agenda, they have a massive impact on his chances of implementing it. I don't dispute the impact of his not knowing, Ed – that's obvious. What I'm emphasising is the illogicality of the media reaction to same.